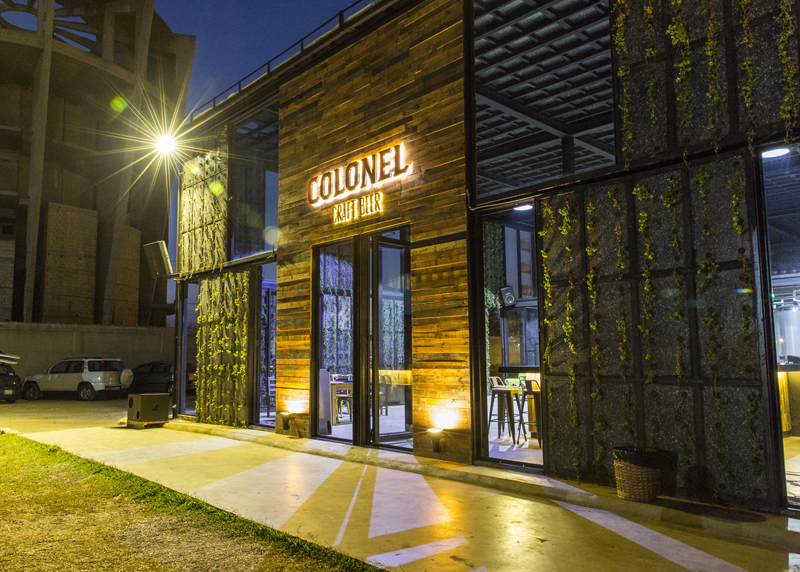 Colonel is located in Lebanon’s northern seaside town of Batroun. Photo by Roland Ragi. BATROUN, LEBANON—Let’s face it, brewing is not something the world is expecting Lebanon to get into right now. The small country is facing another summer of discontent, the latest crisis being a string of terrorist explosions and a colossal influx of Syrian refugees. But, then again, the Lebanese are proven survivors and face challenges in their stride. Take Jamil Haddad for instance. Following a lifelong passion, Haddad launched his Colonel microbrewery this summer in the northern seaside town of Batroun. His family has lived here for generations, just a short distance from where the brewery sits. Growing up he loved distilling and brewing with his dad and years later he honed the process attending courses on brewing in the United Kingdom and Germany. After graduating from college he worked in marketing and sales for a decade, until he decided to pack it all in and take out a bank loan—for the love of beer. His other passion in life is windsurfing so he aptly named his brew after his favorite surf spot, Colonel. As soon as you walk into the Colonel’s yard you realize that this isn’t a normal brewery. No industry noise, no loud machines, just tranquility accompanied by a gentle sea breeze. It’s driven more by idealism than huge profits. Not only is Jamil, 31, brewing great beer here, but also the structure of the brewery, designed by the Lebanese interior architect Nadim Sioufi, is absolutely stunning. It’s also green, made out of recycled wood planks and eco board panels composed of recycled plastic bags. The production of Colonel is small-scale and Jamil wears many hats. Not only in charge of brewing, he also oversaw the development of the building that rose from the ground in just five months. Brew days start at dawn and end at sunset; his brother packed in his job to lend his support. And, then he takes care of diners in the beer garden, always finding the time for a friendly chat with everyone, explaining the concept of craft beer, offering tastings and tours. It’s a long day with a lot of work. “I realized that to be efficient I have to do many things at once,” says Jamil. Brewing is a labor-intensive product that requires patience. And Jamil seems to have a lot of patience. The Colonel lager pours light, with a soft head, and a subtle hop bite. He is also brewing a black ale and Irish-style red ale, serving them up to a growing crowd of beer aficionados in the brewery’s bar and beer garden. Now just to make it clear, Lebanon does not boast a huge beer drinking community; the total yearly consumption of beer is about equal to the amount of beer consumed during the month long Oktoberfest in Munich. And, the local market is dominated by Almaza, a pilsner beer owned by Heineken. A new entry is Beirut Beer, launched a couple of months ago by local beverage producer Kassatly Chtaura , bottling its first mass-market pilsner in the hope of taking a share of the market. But, this entry does not faze some of the smaller brewers. Mazen Hajjar’s beer is pouring more than ever. He launched 961, the country’s first craft beer to be distributed on the market, named after Lebanon’s country code, in 2006 in the midst of a raging war with Israel during which air attacks almost destroyed the brewery. Back then he was brewing in 20-liter kettles; now he’s producing almost 2 million liters of beer per year and is selling to Brazil, Spain, the United Kingdom, Hong Kong, Australia and the United States. Ninety percent of 961 sales, which include lager, red ale, wit beer and porter, are abroad. “The security and economic environment [in Lebanon] is not really fun,” he says. Emile Strunc, the country’s only other serious smaller brewer—of Czech and Lebanese descent—agrees, “Yes it [the political instability] is a threat to craft beer expansion but … it will never discourage our very small group of craft brewers. After all, beer is our liquid bread. Whatever happens there will always be someone making bread for survival and certainly some others making … liquid bread to embellish this survival moment,” says Emile. He is brewing his Schtrunz beer on a very small scale, mainly for family and friends. “I brew approximately eight different styles of beer going from a fruity Saison beer to a creamy Munich Ale to a refreshing South Pacific Ale very rich in hops aromas, to a great Black IPA which will help you reach heaven in a blink of an eye, not forgetting the Winter Alea mix of Apfelstrudel aromas and tastes, and a great light and silky Kölsch.” And, like Mazen and Jamil he believes that the more people they can inspire to experiment in craft brewing, the more people will take up beer drinking over the current popular tipples of arak, an anise-flavored drink similar to the Greek ouzo and vodka. Emile is optimistic that one day they will be able to use hops grown in Lebanon’s Bekaa Valley where it grew centuries ago, rather than importing from abroad. According to a Discovery Channel documentary entitled: How Beer saved the World, this region brought beer to the rest of the world; in 9,000BC barley was cultivated and domesticated to make beer. “It is part of a craft brewer’s dreams and as far as the community of craft brewers is expanding the hope is there,” he says. Read tasting notes on 961 Beer’s Lebanese Pale Ale. Sabina Llewellyn-Davies is a lecturer in Public Speaking & Business Communication at the Faculty of Business and Finance, Sagesse University, Beirut, Lebanon. She contributes to several publications as a freelance writer and is the author of Green Gold, The Abou Abed Joke Book 1 & 2, and Em Abed’s Revenge. Following her passion for mountain hiking she also works as a business development consultant focused on promoting sustainable tourism in Lebanon. This is a great and very actual article on Lebanese beer! Thanks a lot Sabine. That was an enlightening article. It has confirmed my suspicion that Lebanon is a country full of surprises. I just noticed a case of Beirut Beer at my local bottle shop – I will have to check it out.